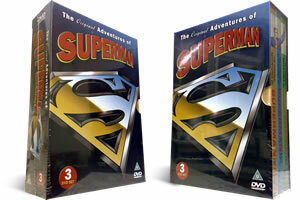 The Original Adventures of Superman Cartoons Triple DVD Box Set. Classic Superman. 17 Classic cartoons in colour from the 1940's. 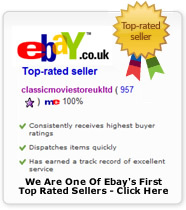 Reduced in price to £9.97 and Delivered FREE in the UK with super saver delivery. Released between 1941 and 1943 this series of seventeen animated short films were based upon the comic book character Superman. The first cartoon in this series, just titled superman, narrowly missed out winning the 1942 Academy award for best short cartoon. With the well known opening intro of "Faster than a speeding bullet! More powerfull than a locomotive! Able to leap tall buildings in a single bound! Superman became a massive hit that we all known today.This DVD is really a special series of the classic cartoon, of surprisingly high quality modern looking colour animation. Its one to have in your cartoon collection. The original superman.